This is a final reminder regarding the up-coming Dhamma Discussion & Meditation Retreat Program "Meditation Beyond Existence" conducted by Ven. Walassmulle Abhaya Thero between May 20th to June 18th, 2017 at the temple premises. If you are interested in participating, you can still register by clicking the link https://goo.gl/forms/2M5pn0kgeU1mPmJo2 . The program will be telecast live through https://www.youtube.com/channel/UCJ9f0cswE2rRuFDplR1ZKsw/feed) as informed previously. We would also like to let you know that Ven. Walassmulle Abhaya thero has prepared a guiding book, "Gamanaka Nimawe Arabhuma" enable devotees to follow the program easily and as well as use it as a reference book in the future. The Spiritual & Meditation sub-committee decided to charge $10 per book to cover the printing charges (actual cost of printing is between $11.50 to $20 depending on number of copies). Each session will be of two (2) hour duration and there will be one (1) hour break in between each session. Ven. Abhaya has designed this program in such a way that Dassanena Pahathabba section will be completed before the commencement of meditation retreat. We would like to encourage all of our devotees and well wishers to join on the first day of the program on May 20th and decide after that whether it is worthwhile to continue or not. The Bavana Pahathabba section will be explained as part of meditation retreat. 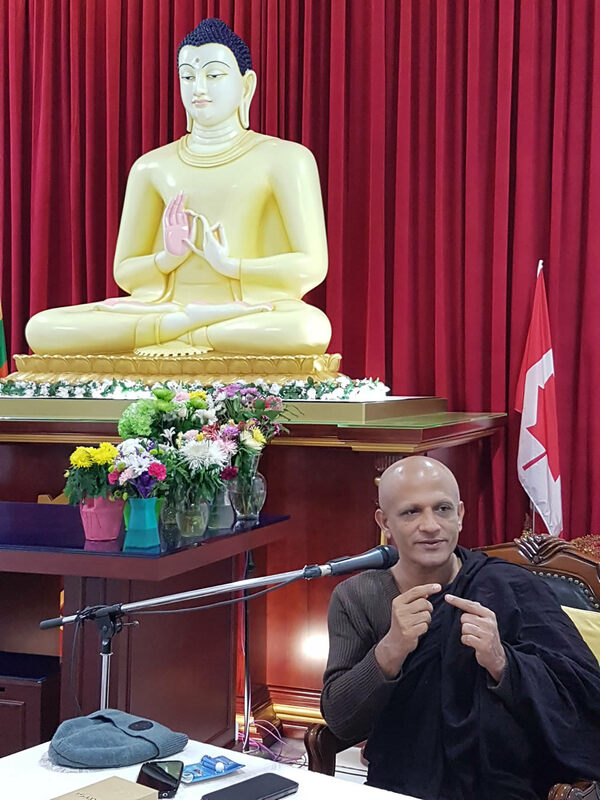 It is a Compulsory per-requisite that one has to attend to above Dhamma discussions (Dassanena Pahathabba) or follow it live online at https://www.youtube.com/channel/UCJ9f0cswE2rRuFDplR1ZKsw/feed) or (නිරපේක්ෂත්වයේ මග - http://www.nirapekshathwayemaga.com/ and follow the link) for attending the 14-day Meditation Retreat from June 05 to 18, as explained in the Nirapekshathwayemaga website. There will be a Dhamma discussion in English on Sunday, June 4 from 6:00 p.m. to 8:00 p.m. No registration is required for this event. If you have any questions or require clarifications on this program, please be kind enough to contact Palitha Perera, committee member of Spiritual and Meditation Sub-committee by sending an e-mail to vancouver.bavana@gmail.com or by calling 778-227-9632.